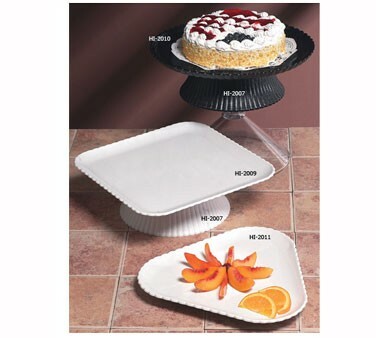 LionsDeal > Catering & Buffet Supplies > Platters and Serving Displays > Plastic Serving Platters > Plastic Dinnerware and Servingware Sets >< GET Mediterranean Polycarbonate Servingware > G.E.T. Enterprises HI-2010-BK Mediterranean Black Polycarbonate Round Plate 13"
G.E.T. Enterprises HI-2010-BK Mediterranean Black Polycarbonate Round Plate 13"
G.E.T. Round Cake Plate, 13", polycarbonate, black, Mediterranean. This plastic round cake plate is from G.E.T. Enterprises, the first name in fine quality melamine food service products. Most products meet NSF standards and are safe and durable enough for use by any restaurant, cafeteria, school, senior citizen"s home or anyone who wants an attractive, almost impossible to break product!